The Ontario government announced that only 25 retail outlets will be open for business on April 1, 2019. That’s fewer than the Liberals had planned for opening on October 17, 2018, and much fewer than the 1,000 stores the PC initially predicted. However, the Doug Ford government doesn’t see it as a flip-flop on its policy, but rather a reaction to a Canadian reality: there isn’t enough supply to meet cannabis demand in Canada. Others, including NDP Deputy Leader Sara Singh, see the back-peddling as a win for black market cannabis. The Cannabis Council of Canada on the other hand called the decision a “measured and responsible approach” to addressing the shortages, noting that empty shelves and inconsistent product doesn’t do anybody any good. 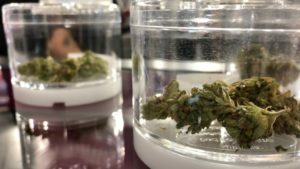 “We must remember that legalization is a process, not an act,” Cannabis Council of Canada executive director Allan Rewak told the CBC in an email. Those 25 licences will be awarded through a lottery process managed by the Alcohol and Gaming Commission of Ontario. Results will be announced in January 2019. There wasn’t any word in the CBC report below about whether or not geographic location would be taken into account, leaving the opportunity, for example, that Toronto could get all 25 licences leaving the rest of the province out in the cold. Cannabis shortages have been reported across Canada. The PC government in Ontario cited store closures in Quebec and elsewhere as part of the reason for the decision to limit the initial licences. There was no word as to when additional licences would be made available.